There’s not much doubt about what tops the ratings on Sunday cable, and AMC’s THE WALKING DEAD did so again, although it was down 0.26 to a mere 7.27. 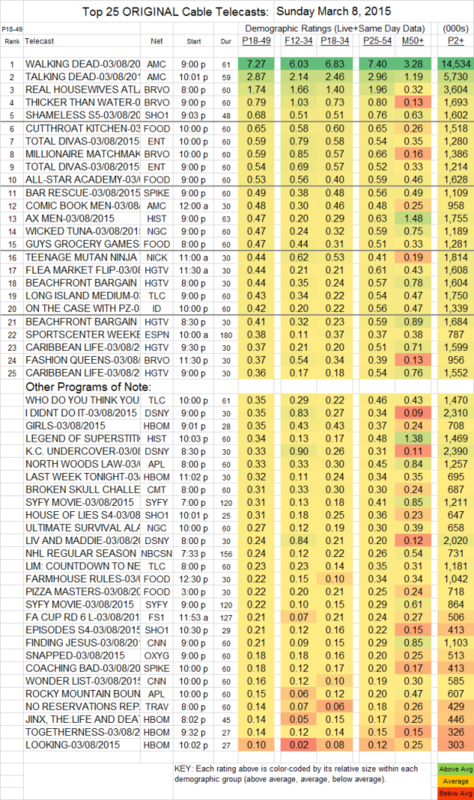 TALKING DEAD followed as usual, down 0.06 to 2.87, and COMIC BOOK MEN later that night was down 0.09 to 0.48. Bravo was also strong, with REAL HOUSEWIVES OF ATLANTA up 0.03 to 1.74, THICKER THAN WATER up 0.09 to 0.79, MILLIONAIRE MATCHMAKER up 0.04 to 0.59, and FASHION QUEENS up 0.05 to 0.37. At Showtime, SHAMELESS dominated pay-cable, up 0.06 to 0.68, with HOUSE OF LIES up 0.03 to 0.31 and EPISODES up 0.07 to 0.21. HBO was subdued with its pre-GAME OF THRONES Sunday line-up, as JINX gained 0.03 to 0.14, GIRLS edged up 0.03 to 0.35, the TOGETHERNESS season finale dropped 0.07 to 0.14 (yes, it’s been renewed despite those ratings), LOOKING dropped a tick to 0.10, and LAST WEEK TONIGHT was similarly down 0.01 to 0.32. TOTAL DIVAS (E!) fell 0.09 to 0.59. BAR RESCUE was down 0.11 to 0.49. On History, AX MEN rose 0.04 to 0.47, and LEGEND OF SUPERSTITION MOUNTAIN was up a tick to 0.34.